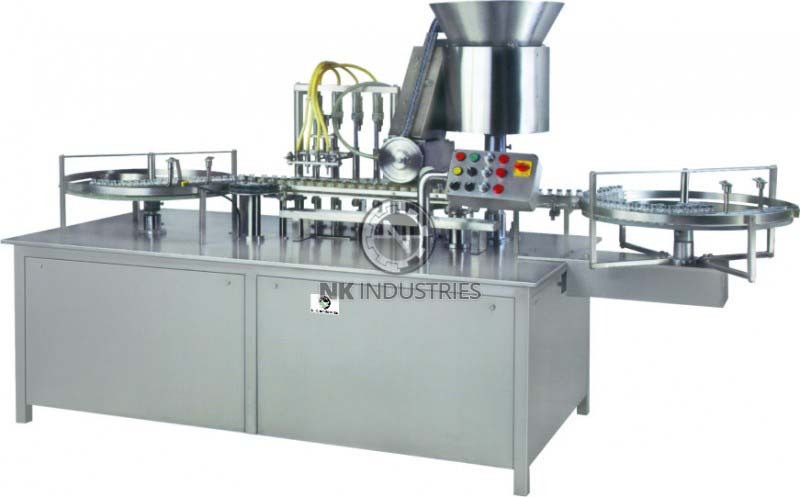 N.K Industries is leading manufacture in manufacturing the range of injectable vial filling & Stoppering Machine. The series of Automatic Injectable Vial filling & stoppering machine are applicable in complex injectable unit of pharmaceutical companies for filling liquid & applying rubber stopper simultaneously in one unit. The range in available in 2 head , 4 head , 6 head , 8 head & 12 head configuration in order to cater low to higher production demand. The Unique features of machine is “No Vial - No Fill” system & No Vial – No rubber stopper system. It can be made available with other various optional accessories like ceiling mounted suspended Laminar Flow hood, Toughened Glass Safety cabinet, Pre and Post nitrogen flushing unit etc. Quite Compact, Modular Design & CGMP Model. Part Comes In Contact With Liquid Are Of AISI 316. Body Structure Is Built Using AISI 304. Appropriate For 1 Ml To 100 Ml Filling Range. Important Individual Part Required For Autoclaving/ Sterilization Can Be Removed Easily. No Need To Shift The Whole Machine Every Now And Then. Co- Eccentric Nozzles Allows Rapid And Accurate Filling Of Liquid In Conjunction With Nitrogen Flushing. No Vial – No Filling System. No Rubber Stopper – Machine Stop System. Suitable For Dry And Wet Rubber Stopper & Supplied With Liquid Collection Tray. Bare Minimum Change Over Time. From One Size Of Container Or Fill Size To Another. PLC – HMI Based Automation. Ceiling Suspended Laminar Flow Hood. 16 MM To 50 MM MAX.